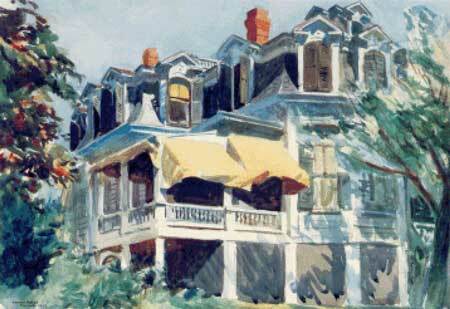 Watercolor of an old three-story house with a mansard roof and yellow canvas awnings sheltering an upstairs porch from the sun. The house is closely surrounded by trees and shrubs. See Mansard Roof for a larger version (more stitches, more detail) or compare them side by side.